A brightly colored cotton flannel with a rainbow of colors including shades of red, blue, orange, yellow, green and white. Fun zoo animals dance across the background including elephants, giraffes, lions, tigers and giraffes. You will find sweet little birds fluttering along with butterflies and alligates smiling at them all. 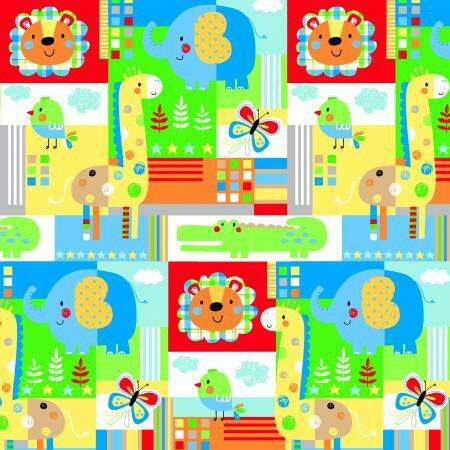 A very warm and soft cotton is a must have for any baby and adorn their baby crib. All fabric from The Quilted Nursery Children's Fabric Store is cut directly from the bolt and we now offer fractional yardage cuts for your shopping convenience. Shipping overages will be refunded upon shipment of fabric.